The majority of countries- 134 out of 195- have abolished the death penalty in law or in practice. Thirty five US states still currently have the death penalty, and only China, Iran, Iraq, and Saudi Arabia had more executions in 2009 than the United States. State-sanctioned killing is a flawed, biased, costly, and unnecessary punishment. High Road mobilizes groups nationwide to end state-sanctioned killing. Utahns for Alternatives to the Death Penalty (UTADP), of which High Road for Human Rights is a part, is a statewide coalition of both secular and religious organizations and concerned individuals dedicated to stopping executions in our state. We welcome you to join us in this goal. 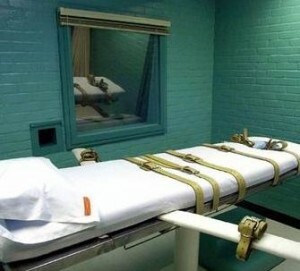 Recognizing that some organizations and individuals who have serious misgivings about the death penalty in Utah may not be ready to call for an end to capital punishment just yet, we also welcome those individuals and groups, secular and religious, who seek a moratorium on the death penalty and the establishment of a commission to study its many disturbing facets. The death penalty is a failed policy that is extremely expensive and ineffective. The costs of successfully executing a criminal defendant are staggering. Data compiled for more than 25 years in virtually all of the states studied consistently show that it costs millions more to execute someone than to keep them in prison for life. The Future of America’s Death Penalty 411 (Carolina Academic Press 2009). It is important to recognize that it is not the execution itself, which is expensive, or that pursuing one execution will costs tens of millions of dollars. Rather these costs reflect the reality that most capital prosecutions never result in a death sentence, and most death sentences do not result in an execution. But the extra expenses begin mounting as soon as counsel is appointed in each potential death penalty case. Smart on Crime Report (2009), Death Penalty Information Center. Death penalty prosecutions cost more because of the courts’ properly imposed stringent due process protections to prevent wrongful convictions and executions. Yet despite such efforts, innocent people are often convicted by mistake and placed on death row. See below. A shorter appeals process in capital cases, which is not constitutionally permissible, would increase the likelihood of erroneous sentences, and do little to reduce the expenses inherent in the trial stage of murder cases. Despite maintaining a death penalty system, Utah has conducted only 6 executions since 1977, and none since 1999. The process is expensive and ineffective. Alternatives to the death penalty should be considered. The death penalty system doesn’t help the families of victims. No one can appreciate the impact of murder on the family and friends of a victim, and no person of good conscience should want to increase their agony. However, because of the extensive constitutional due process requirements in death penalty litigation, trials are lengthy, and appeals can go on for decades. For families of victims, there is no closure. Families who may think initially that the prospect of an execution will provide solace for their loss are usually disappointed. Most murder defendants will not face death penalty charges, and most defendants who are subject to a capital trial will not receive the death penalty. Furthermore, a Columbia University study found that two-thirds of death sentences were overturned. It is a false promise to tell murder victims’ families an execution will provide justice and closure, because the chances of the murderer actually being executed are slim. Instead, the millions of dollars spent on just one death penalty case could be used to support victim assistance programs, which are frequently under-funded. Maintaining a death penalty system diverts resources that could be spent on truly effective crime prevention and detection activities. In a 2009 national poll of 500 police chiefs, the police chiefs ranked the death penalty last in their priorities for effective crime reduction. Smart on Crime: Reconsidering the Death Penalty in a Time of Economic Crisis. The majority of the police chiefs said they do not believe the death penalty acts as a deterrent to murder, and they rated it as one of the most inefficient uses of taxpayer dollars in fighting crime. Additionally, victim advocates in neighboring Colorado argued that money that funded capital punishment would be better spent investigating the state’s backlog of 1,400 unsolved “cold case” murders. Money wasted on the flawed and ineffective death penalty system could be better used to fund these necessary societal needs instead. The death penalty is applied in an arbitrary and discriminatory manner that is socio-economically, geographically and racially bias. In 1976, the high court upheld new capital punishment laws, ostensibly designed to limit the application of the death penalty to only the worst cases and to provide for its consistent application. Nevertheless, there is evidence that the death penalty is far from being consistently applied. Many factors other than the gravity of the crime or the culpability of the offender appear to affect death sentences, including and especially geography, race, and lack of money to hire competent defense counsel. There is indisputable evidence that despite the extra procedural safeguards provided in death-eligible cases, the death penalty process is fraught with error. Innocent people have been convicted and sentenced to death. According to the Death Penalty Information Center, since 1973, 138 people in 26 states have been exonerated from death row with evidence of their innocence. It is difficult to determine how many innocent people have been executed, but we can all agree that even one is one too many. Whatever one’s views on the propriety of maintaining a death penalty system, we should all be able to agree that a system which allows innocent people to be condemned to die is unacceptable. People in the United States and throughout the world increasingly reject the death penalty. The great majority of countries of the world have abolished the death penalty in law or in practice. In 1977, only 16 countries had abolished the death penalty for all crimes. As of December 2009, 134 countries have abolished the death penalty in law or in practice. Only China, Iran, Iraq, and Saudi Arabia had more executions in 2009 than the United States. We do not believe that Utah, or the United States, belongs in such company. And in the United States there are signs of opinion turning against the death penalty. Fifteen states do not have the death penalty. New Jersey legislatively repealed it in 2007, and our neighbor New Mexico also did so in 2009. As a state that asserts a duty to demonstrate moral leadership in the world, we should too. A death penalty system violates the moral codes of Utah’s religious communities. “We believe that the imposition of the death penalty is inconsistent with our religious values, which include respect for human life, nonviolence, restoration and reconciliation, and the message of God’s redemptive love. We believe that each human is created in the image of God, and thus we believe in the inherent worth of human life and the inalienable dignity of the human estate. The value of human life is not contingent on the moral rectitude of human beings or human institutions. It is cruel, unjust, and incompatible with human dignity and self-respect. We cannot isolate ourselves from corporate responsibility for every execution, as well as for every victim. Life without the possibility of parole is the current alternative to the death penalty, and it works effectively both to punish offenders and protect society at a fraction of the cost of the death penalty system. Finally, to quote one of our own state supreme court justices: “Based on our experience, a sentence of life without parole may be less expensive to the state, more miserable for the guilty and more certain for the victims and society.” Menzies v. Galetka, 2006 UT 81 ¶ 123, 150 P.3d 480 (J. Wilkins, concurring). Please join us in the call for ending this flawed, biased, costly and unnecessary punishment in Utah, and for a moratorium on executions while an appointed commission studies the impact of the death penalty on our state.